The General Mat Company has released its largest and most comprehensive ergonomic, anti-fatigue and safety matting catalogue ever produced specifically for the Australian market. 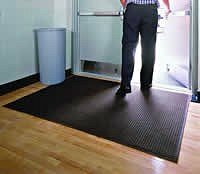 Its 2004-2005 offerings include world-leading brands of industrial and commercial interior and entrance matting designed to increase worker and customer safety while reducing slips, falls, absenteeism and compensation claims. Included in the 30-page publication – which can also be viewed online at www.matting.com.au – are the latest products from leading international manufacturers for which GMC is exclusive national distributor, including The Andersen Company of Dalton Georgia, USA, and Tennessee Mat Company of Nashville, Tennessee, USA. GMC Managing Director Mr Mike Siegle says the new catalogue contains a total of 40 families of ergonomic, anti-fatigue and safety matting, all specifically selected for Australian conditions, which include an ageing workforce and escalating claims for slip and fall accidents across a wide range of industries. New products suitable for applications such as factories, offices, kitchens, cafeterias, shops, warehouses, workshops and worksheds including high visibility Safety Alert Spongecote No 416, fashion-keyed Timbertop No 888, durable multipurpose Diamond Plate No 414, and versatile, interlocking modular 24/7 matting with or without holes for drainage in wet or greasy areas. New also are Gritworks 574/576 (specifically designed to combat slips and falls in wet or greasy areas), hygienic and chemical-resistant SupaGrippa No 156, Comfort Flow 420 and Comfort Scrape No 420 (for people exposed to extended periods of standing) and ErgoDeck super-sized tile system. The GMC’s ranges of Waterhog entrance matting – designed to increase safety and cut maintenance by soaking up dirt and moisture – is expanded in 2004/5 by the addition of Waterhog Premier in roll form 1800mm wide by 20.4 metres long. Special products are available for areas where welding is conducted, or where electrical insulation properties are important. “In addition to increasing worker safety, productivity and job satisfaction, the GMC ranges are selected to help companies comply with State and Federal health, safety, building and insurance requirements,” says Mr Siegle, who is frequently called as an expert witness in compensation cases. “While many employers today are very aware of the need to provide employees and visitors with personal protective clothing and equipment, this is no use whatsoever if they are left exposed to slips, falls and chronic fatigue inquiries. Our aim is to promote safety from the ground up,” he said. GMC’s roll-form matting is available in 600mm, 900mm and 1200mm widths, and 22.8 metres lengths. In addition to standard mats of various dimensions, the GMC ranges include several modular types which can be quickly assembled to cover large areas and awkward shapes. All mats can be cut and edge-beveled to suit particular applications and many are available with safety alert coloured borders. In addition to conforming with relevant Australian HACCP requirements for food manufacturing, GMC has successfully subjected six of its biggest sellers and most versatile mats to the CSIRO’s tests for Slip Resistance Classification on New Pedestrian Surfaces. The new GMC catalogue contains an application guide offering advice on the best type of matting to use in different locations, roles and types of industries.